The two-year research program "The Mycenaean Northeastern Kopais - MYNEKO" (2016-2017) was successfully completed and systematic excavation was carried out on the islets of Agios Ioannis and Pyrgos-Agia Marina in the northeastern part of the lake in northern Copaida, under the direction of Dr. Elena Kountouri, Head of the Department of Prehistoric and Classical Antiquities of the Ministry of Culture. In these two places there were fortifications, residencies of houses with stone walls and superstructure of friezes, as well as burials under their floors, possibly children's, that enrich the existing data on the coexistence of living and dead in Middle Helladic settlements of mainland Greece. As the land at the two sites is extremely rocky for exploitation, it is not excluded that their inhabitants had achieved the creation of arable land at the edge of the lake, which, if confirmed, strengthens the view of some researchers on the Middle Helladic background of drainage works. At the Acropolis of Agios Ioannis the cyclopean fortification, detectable in length of 560 meters, surrounds the plateau of the top, following the line of the rock eyebrow. Excavation cuts along the inner front of the wall revealed an elongated wall interfering with the inner wall of the fortification enclosure that presents, three meters across its internal face, rectangular projections known from buildings with warehouse operation or from internal enclosures on the Acropolis of Gla. Of interest is also the revealing of an animal skeleton section carefully placed per se in a side of the semi-hard ground in a middle-Helladic layer, in the immediate vicinity of the wall. He was identified with a female equine, who also finds examples on horses that accompany burials in vaulted tombs of the Mycenaean times. In the middle and northern hill of the hill, clusters of box-like tombs of the same period, which in some cases are surrounded by a stone built courtyard and covered by a low tumulus, according to the tradition of circular burial architecture with the Peloponnese and neighboring Fthiotida Antorns). On the other hand, without a typological parallel, at present, it is a rectangular burial enclosure that has come to light, a particularity that may have implied the quality of the soil in combination with the family available burial space per family. 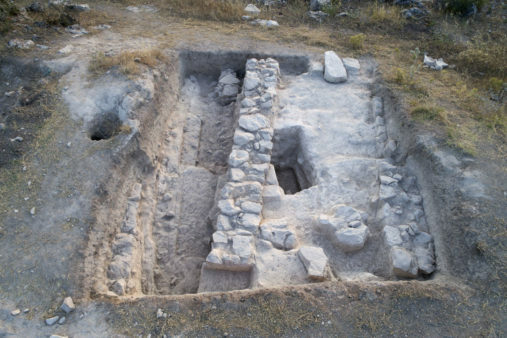 The building remains found on the hill of Agios Ioannis, combined with the mainly made of coarse and semiconductor ceramic cookware, allow the chronological redevelopment of the oldest, at present, residential building phase in this place around the middle of the 17th century BC . (Middle Helladic III / HR I period). 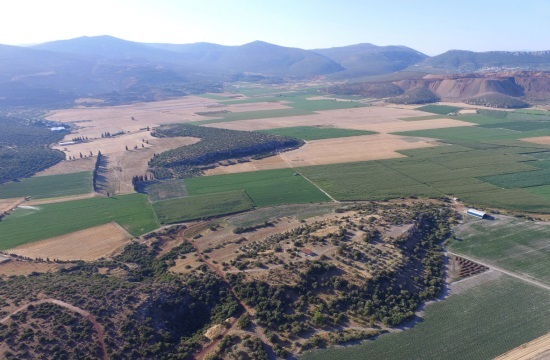 The results of the survey are particularly encouraging, as they brought to light new facts about the Middle Helladic and Early Mycenaean background of the settlements developed on the northern margin of the lake. In addition, the finding, with stratigraphic data, that the fortified settlements in the hills of Agios Ioannis and Aghia Marina have a phase of fortification, rehousing and abandonment chronologically analogous to the acropolis of Gla, ie around the middle of the 13th century BC, a milestone of the problems of the socio-political hierarchical relations of the Mycenaean northeastern coppaid field, as well as of the Orchomenos-Glas dipole. 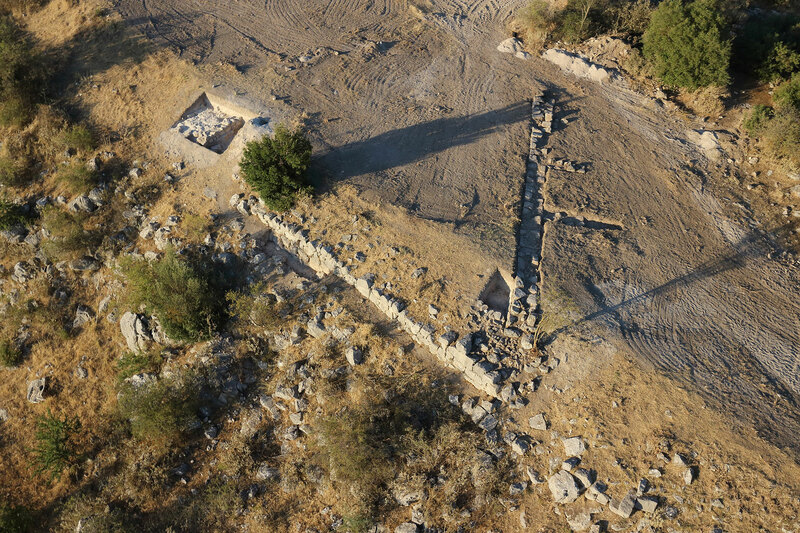 Finally, it reinforces the opinion of the investigator that around 1250 BC a gigantic scale building project took place in northern Copais, at the initiative of the Orchomenos palace center. Orchomenos, a continental and predominantly littoral force, which undoubtedly plays an early role in the region, was more focused on Central Greece, investing less in the overseas relations, such as Thebes, but in tending its unique natural resource in favor of the objective of self-sufficiency in cereals and other yields. In order to achieve these goals, an extensive technical project for the drainage of the northern part of the lake was set up, the Gla Acropolis was set up in a crucial place to allow control of the drainage works of the lake, and a series of facilities were re- such as Agios Ioannis and Agia Marina, on the one hand for oversight of the sinks, the blockage of which could lead to a drainage project failure and, on the other hand, for the possibility of direct access to maritime trade routes. The program was implemented with the financial support of the Institute of Aegean Prehistory (INSTAP), the Psycha Foundation and the company Lava SA, while the Municipality of Orchomenos and the Local Community of Akrafioni warmly supported the research. A close collaborator of the program was Professor Michael F.Lane of Maryland Baltimore County University (UMBC), while Assistant Professor of Science and Technology at the Institute of Science and Technology in Archeology (EKETA) of the Cyprus Institute, Evi Margaritis, has undertaken the study of plant debris in order to reconstitute the paleoenvironment and the agricultural practices of the region.